Cash on collection. Any item that is not photographed will not be included. We hope you will be very happy with your item. Power Tools. If there is an issue with your item and you believe it to be faulty we will help you as quickly as possible. Power: 65W. 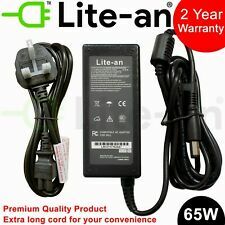 AC Input: 100~240V / 50-60HZ. Warranty: 1 Year. Product Details. Description: Input voltage: 100-240V ~ 1.5A, 50 - 60Hz Output voltage: 19.5v ~ 3.34A, 65Watt Size of connector: 7.4X5.0mm *Please be advised that the item is compatible replacement but not genuine product. Dell P/N numbers: 9T215, NADP-90KB,310-2860, 310-3149, 310-4408, 1X917, AA22850, PA-1650-05D, 5U092, T2357(PA-12 PA12 family) Compatible Models: Dell Inspiron: 1150 1420 1501 1520 1521 1525 1526 1720 1721 6000 6400 8500 8600 9200 9300 9400 300M 500M 505M 600M 630M 640M 700M 710M E1405 E1505 Dell Latitude: 100L 131L D400 D410 D420 D430 D500 D505 D510 D520 D530 D531 D531N D560 D600 D610 D620 D630 D630N D631 D631N D800 D810 D820 D830 D830N X300 Dell XPS M140 M1210 M1330 M1530 Dell Studio15 17 Dell Precision M20 M2300 M4300 M65 M70 DellVostro 1000 1400 1500 1700 Package: 1x adapter and U. 1 X Power cord. 1 X Power Adapter. Power: 65 Watt. Warranty Claim Process This limited warranty does not affect your statutory rights provided by law. Output Current: 3.34A. Expected Dispatch. Compatible Model: Dell Inspiron Series: 1150 1420 1501 1520 1521 152517201721 300m 500m 510m6000 600m 630m 6400 640m 700m 710m 8500 8600 9200 9300 9400 E1405 E1505 E1705. Dell Latitude Series: 100L X1 X300 XT Tablet PC E5400 E6400. For Use with Dell 745 755 760 USFF 12V 18A. 10x UK Mains Power Lead. This Sale is for. The adapters are used but in perfect working condition. OptiPlex 745 model DCTR [Ultra Small Form Factor]. OptiPlex 760 model DCTR [Ultra Small Form Factor]. OptiPlex GX620 model DCTR [Ultra Small Form Factor]. OptiPlex SX280 model DCTR [Ultra Small Form Factor]. OUTPUT - 12V 18A. POWER CORD NOT INCLUDED. Pictures are of the original product. Compatible with Dell 6C3W2 Dell DA90PM111 Dell PA-1900-02D3. Efficiency that makes a difference Green Cell power supplies let you enjoy your laptop without worrying about power loss. Original Green Cell Adapter. 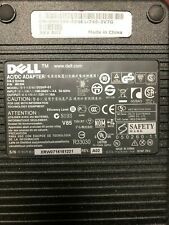 New DELL 90W 4.62A 19.5V - LA90PM130 AC ADAPTER PA-3E JCF3V 6C3W2. Note that you need Clover/UK power lead. Power Lead not included. 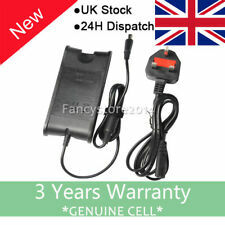 UK 3-PIN POWER CORD INCLUDED. Inspiron 17 (1750). Inspiron 17 (1764). Inspiron 15 (1525). Inspiron 15 (1526). Inspiron 15 (1545). Inspiron 15 (1564). Inspiron 14 (1440). Compatible with Dell 06C3W2 Dell DA90PE1-00 Dell LA90PE1-01. Efficiency that makes a difference Green Cell power supplies let you enjoy your laptop without worrying about power loss. Original Green Cell Adapter. Dell Slim - power adopter GENUINE DELL LATITUDE PA-3E 90W JCF3V LA90PM130 6C3W2. Fully tested working, in good cosmetic condition. Some of the rubber coating is sticky/coming away. CHEAP 17" TFT Monitor - Assorted Makes- Acer Dell HP Hanns G (FREE CABLES). We do just give the check warranty of battery on arrival. Hard Drives. You May Alsolike these. Need Help?. 100% Britain family owned & operated.